Our 10-day silent medi­ta­tion re­treats start at the 1st of each month. Reg­is­tra­tion has to be in per­son on the last day of the pre­vi­ous month. Advance booking is not pos­si­ble. The re­treats end on the 11th day of the month. There are no shorter or longer re­treats avail­able and it is not pos­si­ble to join only part of a re­treat or to start a retreat or other or­gan­ised ac­tiv­i­ties at other times of the month. 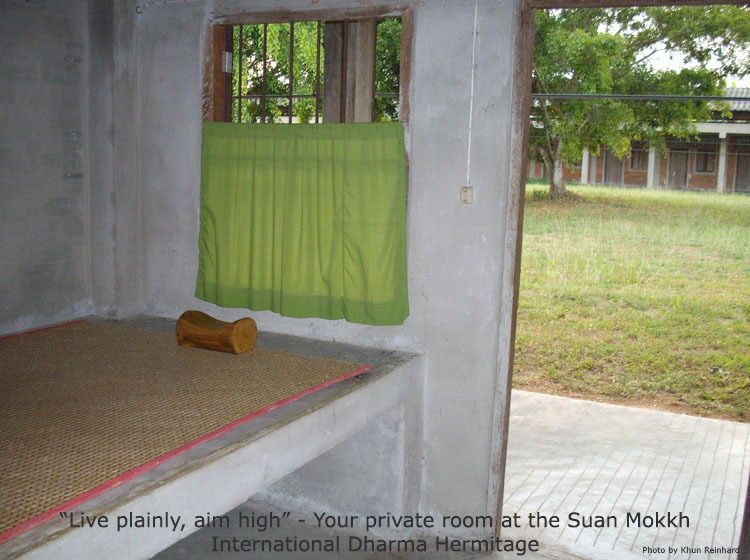 However, every­one is welcome to visit the main mon­as­tery at Suan Mokkh between re­treats to do their own prac­tice (full details on the Wat Suan Mokkh page). 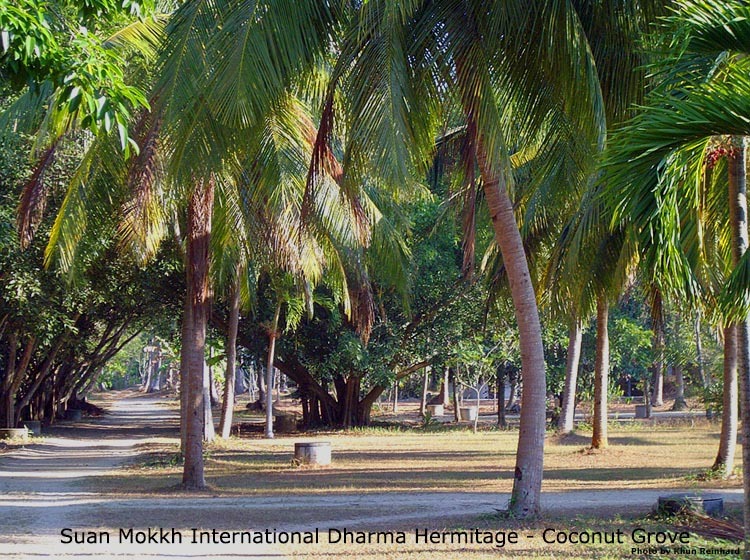 The Suan Mokkh In­ter­na­tion­al Dharma Hermitage was found­ed by the Ven­er­able Ajahn Buddha­dasa in 1989. Since then about 25,000 people, coming from all over the world, from many walks of life, between 17 and more than 70 years of age, have par­tici­pated in the monthly medi­tation retreats here. The retreat allows us to with­draw from our usual ac­tivi­ties to a quiet and secluded place and devote our time to study, con­tem­pla­tion and med­i­ta­tion. 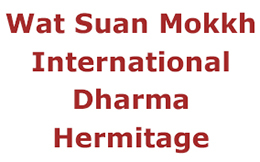 The teachings and the struc­ture of the retreats at the Inter­na­tion­al Dharma Hermitage of Wat Suan Mokkh are designed for a period of 10 days and therefore we ask the par­tici­pants to commit them­selves for this period of time. We do not accept people for less than 10 days. Besides learning and practising how to meditate, par­tici­pants will get an intro­duction to some other aspects of the Buddha's teaching, including the Four Noble Truths which in­clude the Noble Eightfold Path. In order to do the retreat suc­cess­fully, you must be really free from all com­mit­ments for the pe­riod of the retreat. All phone calls, e-mail, letters, tickets, flight con­fir­ma­tions, money changing, visa extensions etc. must be arranged and organ­ized before the retreat begins. There is no way to do them during the retreat. Your phone, tab­let, notebook etc. has to be de­po­sited for safe keeping during the retreat. You must be in good general health, both physi­cally and mentally. 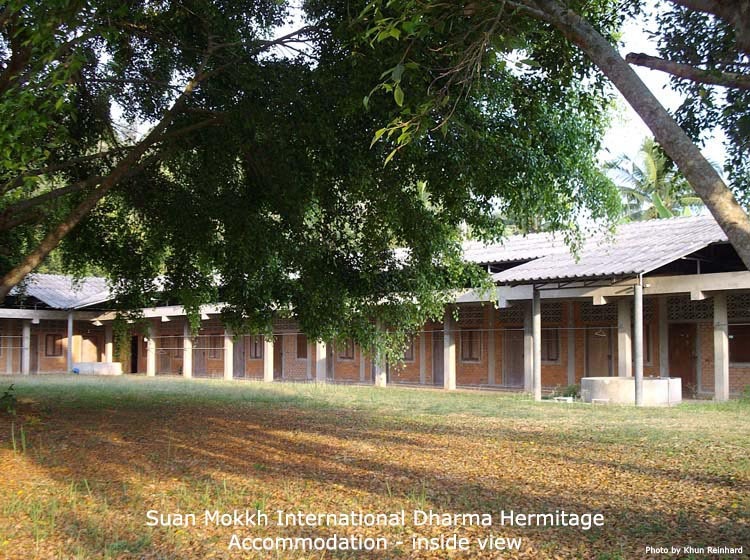 The retreat is not suitable for people with mental disorders or drug addictions. The private room for your use is small, con­tain­ing just a hard bed with a simple straw mat, a blanket, a mos­qui­to net, and a wooden pillow. Toilets (mainly Western style) and baths (Asian style mandi) are shared fa­cil­ities. We'll have two vegetarian meals a day plus a drink in the evening. We cannot provide any extras or special diets and you may not bring	any food or drink in the retreat. Loose clothing e.g. T-shirt, fisher­man pants. Due to monastic custom the body should be com­plete­ly covered from the shoulders to below the knees, in­clud­ing the upper arms. No see-through clothing please. It is not necessary to dress in white during the retreat. Slippers, since shoes have to be taken off in all buildings. Personal toiletries, mosquito repellent, towel, hand mirror for shaving. Umbrella or raincoat (during rainy season). Some purchases (toiletries, etc.) can be made during the retreat at our small shop.